Abstract: The endemic aquatic acritarch Decahedrella martinheadii is confined to the Atlantic sector of the high northern latitudes in the Miocene and has been previously considered as useful for iostratigraphy and paleoenvironmental interpretations in temperate to cold water environments. 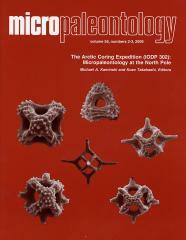 Stimulated by its recovery in Neogene sediments from the Lomonosov Ridge (Central Arctic Ocean) during IODP Expedition 302, the stratigraphic and biogeographic distribution has been compiled to revise its age range based on the Astronomically Tuned Neogene Time Scale 2004, and to assess its paleoecologic affinities. The biostratigraphic revision reveals that this species is restricted to the late Middle to Late Miocene. The first appearence is inconsistent at the various sites but was probably in sediments younger than 13 Ma, whereas the last appearance is a relatively well-constrained datum in the Norwegian-Greenland Sea at around 6.2 Ma. Decahedrella martinheadii was particularly abundant and had its widest biogeographic distribution in the northwestern North Atlantic Ocean, the Norwegian-Greenland Sea, the Fram Strait and the Central Arctic Ocean in the Late Miocene suggesting that it was adapted to temperate to cold seasonally ice-covered surface waters. This species evolved during the global cooling after the mid-Miocene thermal optimum, and it became extinct when small-scale glaciations developed in the Northern Hemisphere in the latest Miocene. Moreover, fundamental reorganisations of the circulation system and the water mass characteristics may have affected the distribution of this species.